Fur kiddo’s coat looking a little dull? Four-legged friend itching like crazy? Add a daily helping of The Missing Link ORIGINAL Superfood Skin & Coat formula and let the “good hair days” roll! Chock full of not only balanced Omega 3 and 6 fatty acids, but phytonutrients and dietary fibers too, this power packed superfood supplement goes to work on helping your fur kiddo be healthy both inside and out. We’d say that’s a pretty potent spoonful. 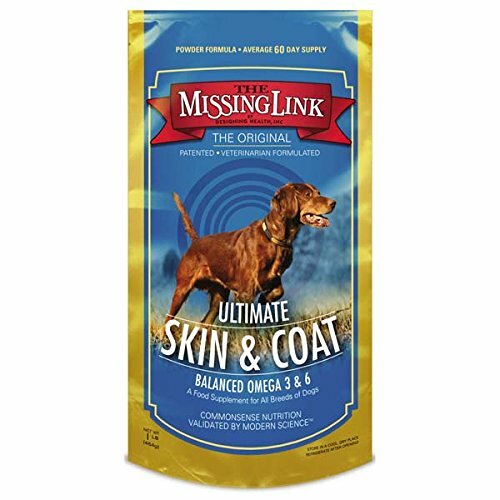 SKIN & COAT HEALTH - Add a daily spoonful of Omega 3 and 6 fatty acids to your dog's food to help with shedding, soothe dry or irritated skin, reduce itchiness and improve overall skin and coat. POWERFUL POWDER - Chock full of healthy skin and coat promoting superfoods like fresh ground flaxseed and kelp. Plus dietary fiber and phytonutrients to support the digestion and overall health. NON-GMO ALL NATURAL SUPERFOOD NUTRITION - Our cold processed supplement packs all of the vital nutrients your dog's kibble is likely missing through sourcing and/or the cooking process. ONLY THE GOOD STUFF - You won't find any artificial colors, flavors, preservatives or GMOs in our ingredients, only the best wholesome nutrition on earth. FEED ONCE DAILY - Depending on your dog's weight, add the suggested amount to your fur kiddo's food as a daily supplement. This product is formulated for all dog breeds. If you have any questions about this product by The Missing Link, contact us by completing and submitting the form below. If you are looking for a specif part number, please include it with your message.